Today, Microsoft has added a feature to Bing that allows the search engine to query the Internet for so-called real-time data, including postings from Twitter users. Microsoft is currently looking to make a bigger splash in the search market. Through the first nine months of 2008 the company committed more than $1.5 billion to acquiring search, or search-driven businesses including a $1.3 billion buyout of enterprise specialists Fast Search & Transfer. Now Bing not just as a search site, but as a so-called decision engine. Gmail(GoogleMail) is a free email service with innovative features like conversation view, email threads, search-oriented interface. 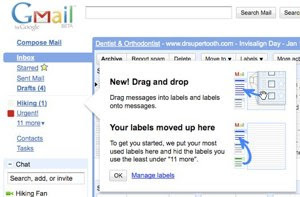 Now Gmail constantly adding features to help people become more organized. Google has updated its Labels feature to add more functionality to the labels toolkit, helping users implement labels in a more organized way. Now the updated Labels feature to be located in a new area on your Gmail interface, above your chat list and grouped together with Inbox, Drafts, Chats and other system labels. You can also now control which labels that you would like to show and you can hide the rest under a more tab. It’s also possible to drag labels into the more menu to hide them, making it easier to change labels than going to the Settings function. Of the more innovative features that have been added is the ability to drag and drop messages into labels, just like you can with folders. You can also drag labels onto messages too.